This year’s event sadly lacks such a unifying theme, unless one counts Nike’s attempt to clad all its contracted players in several shades of retina-searing Day-Glo. Roger Federer and Victoria Azarenka both turned up dressed as tennis balls. There’s a particularly ambitious pink and yellow ensemble favoured by many of the men. The real shame is that Fernando Verdasco, sponsored by Adidas, missed out. H&M has draped Tomas Berdych in delicate sea foam. The marquee first round match, obvious the moment the draw was released, was between Juan Martin del Potro and Jerzy Janowicz. Due to chronic health concerns (del Potro – wrist; Janowicz – brain), neither man was seeded. Unfortunately the surgical steel and good wishes holding Delpo’s wrist together failed again, and he withdrew. Honours for most enticing first round thus fell to Grigor Dimitrov and Dustin Brown, assuming Brown could bring the notoriously cavalier attack that can trouble any top player. Alas, he instead brought the erratic mess that saw him lose in the first round of qualifying last year, and ensured he was the first player to exit this year’s main draw. Dimitrov, his countrymen exhorting him with ancient Bulgar war cries (‘Gri-gor Dim-i-trov!’), won in under seventy minutes. Andreas Seppi and Denis Istomin were delivering a longer and more diverting spectacle on the remote Court 22, a match the Italian eventually took 6/4 in the fifth. Next door, Richard Gasquet was noticeably better than Carlos Berlocq in every aspect of the sport that counted, and won a very entertaining baseline duel in straight sets. Seeded only twenty-fourth this year, I suspect Gasquet will remain largely unnoticed until the fourth round, where he’ll doubtless provide a launching ramp for professional underdog Rafael Nadal. Bernard Tomic’s retirement against Nadal in the opening round of last year’s Australian Open was held to be an indictment against his character in those quarters of the Australian media that dare use the term ‘un-Australian’ with a straight face. 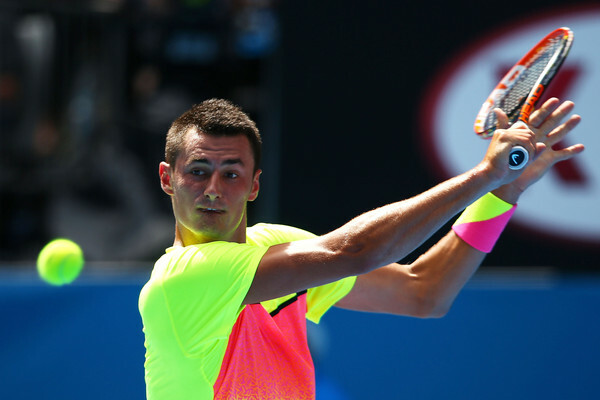 The Herald Sun announced that Tomic had ‘at last wasted the nation’s goodwill.’ The lowly status to which he has sunk was made apparent by his relegation to Hisense Arena, now the event’s third court, and the fact that the camera pit was all but empty as he and Tobias Kamke got under way. Only the general public seemed still to hold Tomic in warm regard, in clear contravention of tabloid edict. Initially it was hard to see why, as the enterprising Kamke came within a point of establishing a 4/0 lead in the opening set. I suspected even then that it was only a matter of time before Tomic dragged his opponent back down to a more governable level. Time here is the operative term; not merely operative but relativistic. Short of accelerating to the speed of light – notoriously hard to do – sitting through a Tomic match is the best way to experience temporal dilation. Spectators emerging from a Tomic match when he’s in an especially deflationary mood will find that those outside the stadium have aged at a different rate. For poor Kamke it was like trying to fight cosmic entropy. 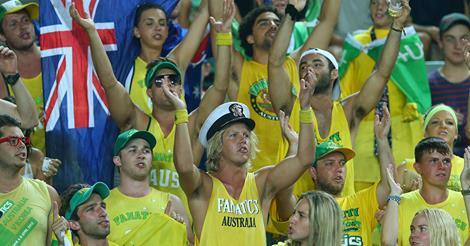 The only force powerful enough to disrupt the Tomic Effect – although one must acknowledge Gilles Simon’s strong work in the field – are the Fanatics, that gaggle of vociferous Australian yahoos whose ability to find seats together impresses more than their attempts at close-harmony. Periodically, as I drifted off during a sequence of backhand slices only measurable in geological time-scales, I was jolted back by a rendition of ‘Walking in a Winter Wonderland’, with key words cunningly replaced by ‘Bernard Tomic’. The Fanatics’ vigour was admirable, but I couldn’t help but wonder if it rather ran counter to the mood Tomic was striving to create. Without them, Kamke might well have been submerged a set earlier. I confess I didn’t stick around for the end, but took a slow turn through the grounds, where to my delight I discovered Philipp Kohlschreiber and Paul-Henri Mathieu about to kick off. The German hasn’t been in tremendous form of late, and it was so far turning out to be a dismal day for his compatriots – in addition to Brown and Kamke, Lisicki and Kerber had also fallen – but he set about his task of reviving national fortunes with his usual lack of caution, and an unusual lack of errors. He has never received much credit as the perennial flag bearer for German men’s tennis. Witnessed from extreme close range, Kohlschreiber in full-flight is awesome to behold. Mathieu didn’t stand a chance. At one point he did stand on the baseline while serving, and was duly called for a foot-fault. On cue he launched in that classic aria ‘This is first time I’ve been foot-faulted in years’ – originally from Cosi fan tutti. Thus do they all. (Serena Williams famously performed a gangsta rap version at the US Open a few years ago). Mohamed Layhani was unmoved, though he did leap to Mathieu’s defence a game later when someone in the crowd abused the Frenchman. It was the closest I’ve ever seen Layhani come to anger, snarling ‘Show some respect!’ and staring the miscreant down between points. None of this helped Mathieu withstand Kohlschreiber’s relentless assault. The German meets Tomic next, a tougher test of his psychic reserves. A cramping James Duckworth chose that moment to complete a remarkable five-set victory over Blaz Kavcic. Two years ago this pair fought out an equally memorable match in tougher conditions, with a different result. Last year Kavcic reached the third round, and will thus shed some points. Afterwards Duckworth kissed the court. Marinko Matosevic earlier recovered from a set down to record his maiden win at the Australian Open, a result he was clearly unprepared for given how he darted erratically about the court, bellowing self-congratulation into stray cameras. He doesn’t like people calling him ‘Mad Dog’, but gave them little reason not to. There’s still a tendency for the Australian public to pair Thanasi Kokkinakis and Nick Kyrgios due to their Greek heritage and surnames beginning with the same letter, a tendency the player’s themselves do little to quash. The Australian media, gifted at devising nicknames, has dubbed them the Special K’s. By simultaneously battling through five set first rounds on Monday night they’ve given the public no reason to decouple them, nor any reason to think them less special. Still, if a point of differentiation were required, one need merely look at their respective post-match celebrations. Kokkinakis’s victory over Ernests Gulbis was a fraught and predictably weird encounter, lowlighted by the second set, when the Latvian admonished the crowd to ‘show some respect’ (echoing Layhani) on the way to being bagelled. Upon winning Kokkinakis immediately executed a complicated semi-backward roll with a kick, in that outfit the only breakdance move visible from space. Only then did he remember to shakes hands with his opponent and the umpire. Formalities dealt with, he embarked on a victory lap of Show Court 3, high-fiving the front row as he went. By contrast, Kyrgios spent long portions of his match against Federico Delbonis excoriating himself, remonstrating with the umpire, destroying racquets, and glaring sullenly at overly rambunctious members of the crowd, whom I suppose weren’t showing enough respect. (perhaps the day did have a unifying theme). This vibe prevailed even after winning. His on-court interview was a masterpiece in surly awkwardness. No one watching Channel 7’s coverage will have missed the fact that this is Lleyton Hewitt’s nineteenth Australian Open, though the significance of this number isn’t made clear. There are constant promos, and they periodically show a retrospective of the Our Lleyton’ career, including rare archival footage of his debut against Bill Tilden. His legendary status assured, we’re also led to believe that he is the driving inspiration for our aspiring youngsters. Discussing the admirable mental strength of Kyrgios and Kokkinakis, Roger Rasheed declared: ‘Where did they learn all that? Lleyton Hewitt.’ Hewitt celebrated the commencement of his nineteenth Australian Open by defeating Ze Zhang in four sets. It doesn’t seem like much, but it is only the third time he has managed to pass the first round since 2009. Under the adoring gaze of the Fanatics, he commenced his patented routine of ‘Vicht’ salutes and simulated lawn-mower ignition. Gael Monfils had rather a tougher time against the much tougher Lucas Pouille, recovering from a two set hole and a break down in the fifth. Pouille, resplendent in Nike’s fluorescent green, fought admirably, but still has a lot to learn about being a French male tennis player. Fortunately he had an accomplished master up the other end. Monfils’s double-fault on his first match point was a lovely touch. Alexandr Dolgopolov withdrew from the Kooyong exhibition final on the weekend with a bad knee, leaving him in doubt for the Open, and raising the hopes of one potential Lucky Loser. As it happened Dolgopolov did not withdraw, which left his opponent Paolo Lorenzi in the strange position being a favourite for the time in a Grand Slam. Sadly he lacked Nadal’s resources to deny this status. In any case it proved justified: the entirely uncompetitive Dolgopolov lost in straight sets. Depending on how you look at it, he thus cruelly denied a struggling journeyman $34,500, or gifted Lorenzi a much bigger one. I look at it the first way. So glad to be reading your updates from Australia, Jesse. Thanks for sharing. So glad too to be reading your post… Your talent and wit are weaving the unifying threads of this intriguing Australian Open and seeding smiles all over the planet. Thank you so much. May you enjoy tennis in daylight as long as it lasts in your hemisphere!